Philips Grand Challenge, hosted by Philips and the University of Pittsburgh Innovation Institute, awarded four University of Pittsburgh faculty members a total of $100,000. Each is innovating in the area of sleep and respiratory care. McGowan Institute for Regenerative Medicine affiliated faculty member Prashant Kumta, PhD, along with Puneeth Shridhar, MD, both teaching engineering, received the competition’s 2nd Award, a total of $30,000. They developed BreathoMag, a dissolvable nasal stent made of magnesium alloy to open the nasal passage. Sinus inflammation, a blocked nose, or a deviated septum can lead to snoring and sleep loss. Silicone and nitinol nasal stents address this problem by opening the nasal airway, but these devices can be uncomfortable and require periodic reinsertion. BreathoMag is a nasal stent composed of a novel magnesium alloy that comfortably opens the nasal passage and then slowly and safely absorbs into the body. 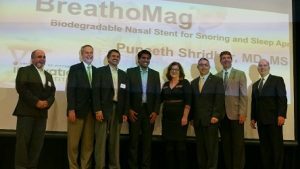 Patients can place the stent themselves, making BreathoMag a user-friendly way for patients to sleep, breathe, and feel better. Also noted, the project of McGowan Institute affiliated faculty member Rory Cooper, PhD, and Mark Greenhalgh, entitled PTS Aware, was a finalist in the competition. PTS Aware is a predictive smartphone application for PTSD mindfulness. The Philips Grand Challenge is designed to enhance opportunities for innovations developed at the University of Pittsburgh in areas of interest to Philips to advance towards commercialization. The Challenge, is intended to provide financial support that cannot typically be obtained from other traditional sources of funding (including the faculty member’s department/school or external government funding agencies). Philips is a global leader in health technology with more than 40 years of leadership in sleep apnea management, oxygen therapy, noninvasive ventilation and respiratory drug delivery. Dr. Kumta holds the Edward R. Weidlein Chair Professor with Tenure at the University of Pittsburgh Swanson School of Engineering and School of Dental Medicine and is a professor in the Departments of Bioengineering, Chemical and Petroleum Engineering, Mechanical Engineering and Materials Science, and Department of Oral Biology. He is also Engineering Director of the Center for Craniofacial Regeneration (CCR) and the Founding Director of the Center for Complex Engineered Multifunctional Materials (CCEMM), both at the University of Pittsburgh. Dr. Cooper is the FISA & Paralyzed Veterans of America (PVA) Chair and Distinguished Professor of the Department of Rehabilitation Science & Technology, and professor of Bioengineering, Physical Medicine and Rehabilitation, and Orthopedic Surgery at the University of Pittsburgh. Dr. Cooper is Founding Director and VA Senior Research Career Scientist of the Human Engineering Research Laboratories, a VA Rehabilitation R&D Center of Excellence in partnership with Pitt.